The policies of the Netanyahu government treat the future of the next generation of both Israelis and Arabs, with contempt. Netanyahu and his cabinet know fully well that they are on a deliberate trajectory towards an escalating conflict with the blockaded peoples of Gaza and the West Bank who are forced to live and work with virtually no electricity or power, whilst Israelis in Tel Aviv’s affluent marina playground, plan their next luxury vacation to New York and the capitals of Europe. Former Palestine is a land where IDF soldiers strut their stuff in the coffee bars fronting Tel Aviv beach whilst the indigenous Arab population is forced into massive unemployment by the Israeli occupying power and its economic blockades. When the now inevitable war does start: when the nuclear warheads are deployed: when the clouds of deadly radiation are released – they won’t, of course, stop at the Eastern Mediterranean. They will also bring death and sickness to all who will breathe in the cancer of the contaminated air from the Negev desert to poison even those who mistakenly thought they would be immune. [In Israel itself, all residential properties have to have a nuclear- fallout shelter, by government decree]. The above scenario will be the terrifying consequence of today’s unqualified Western support for the occupation of the Holy Land, and the 10-year, inhuman blockade of essential supplies to over half a million families in Gaza, by the Likud government of Benjamin Netanyahu. 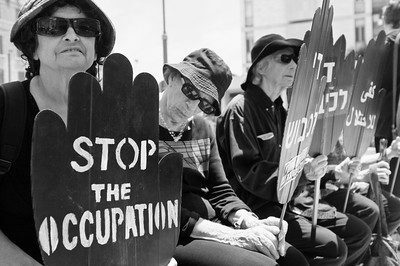 And it is precisely that overt support for the illegal settlements plus the economic blockade and Israel’s rejection of UN Security Council Resolution 2334, which is the crucial driver of increasing antisemitism in Britain, Europe and around the world.